Leaving Wangdi we felt even sadder. 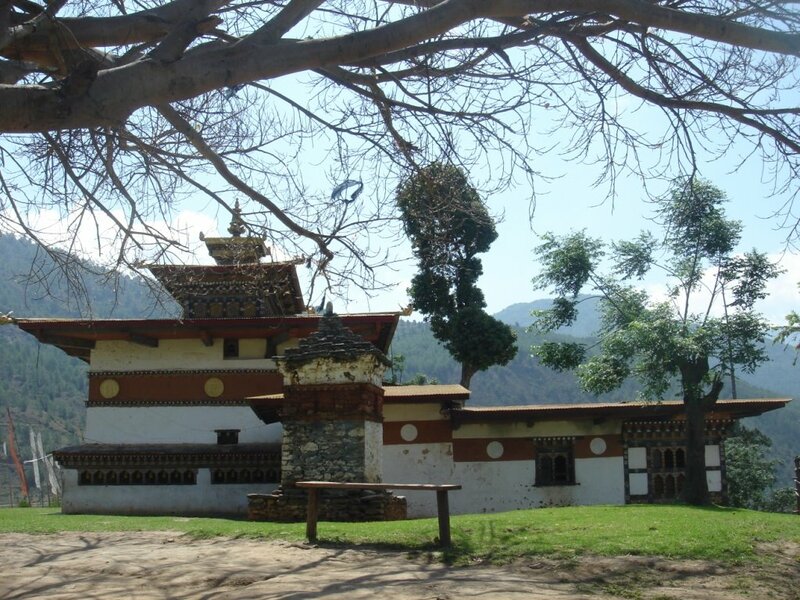 Stopped en route to heading back towards Paro to visit a temple at the border of Thimphu, Punakha & Wangdue Phodrang – Chimi Lhakhang – built in the 15th century in honour of ‘the divine madman’ Lama Drukpa Kinley, a revered saint who taught through jokes and fun and was known for his sexual conquests. 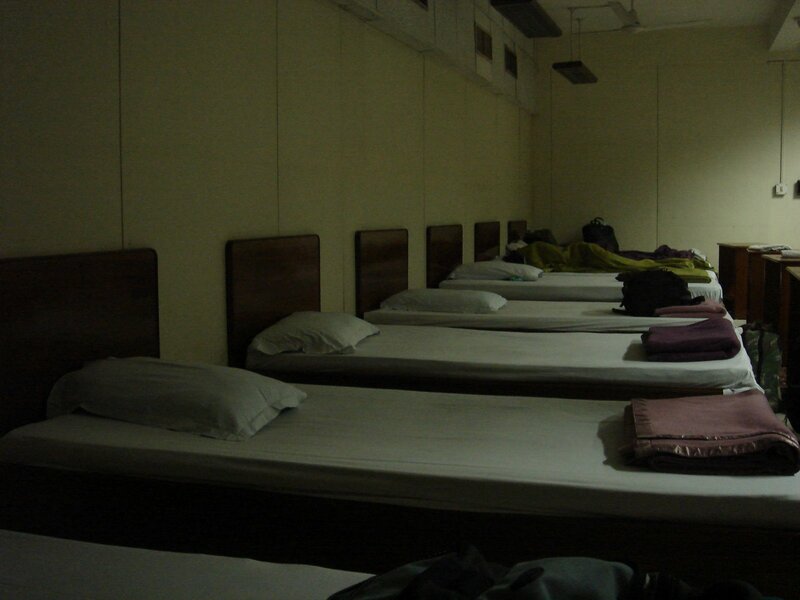 its usually visited for children, either to pray for their protection, or to pray for a child. 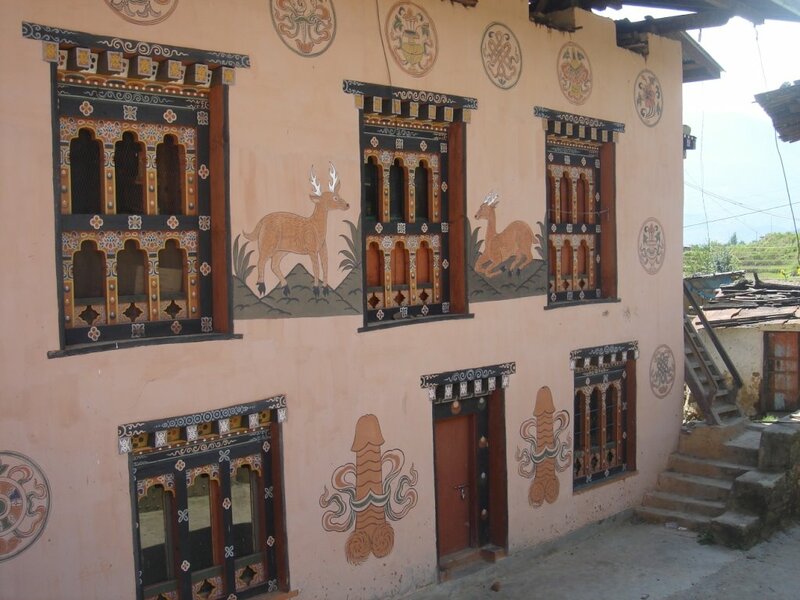 in honour of the divine madman, phalluses are painted on many of the houses. 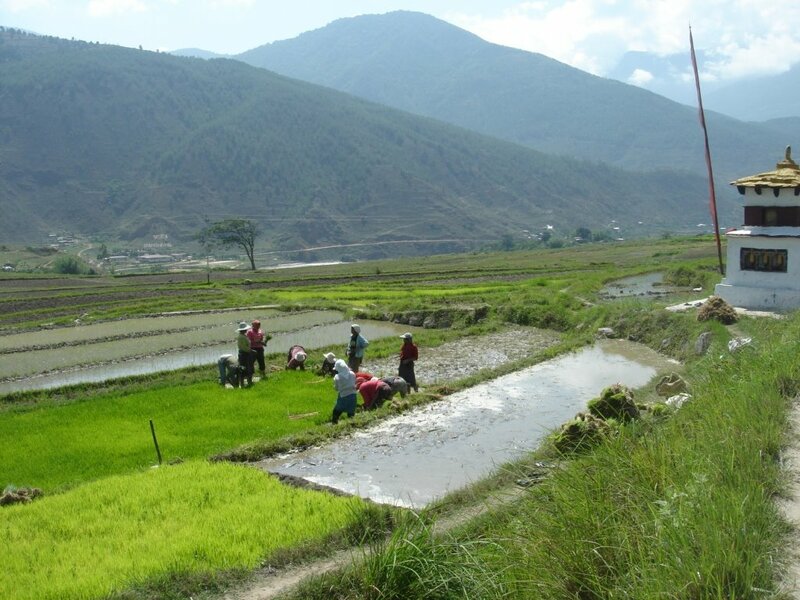 its about a 20 min walk through the rice fields of the village of sosokha to the temple. it was a perfect day, and we enjoyed the walk. after this we retraced much of our earlier route, stopped at Thimphu for lunch – where the friend finally got the peanut butter and chocolate pastry again (that she had been fantasising about, i have to say the pastry was excellent), that we had at Art Cafe, we also did a little more shopping, and then headed back to Paro, taking the shorter 1.5 hour route this time. it was raining & absolutely dreamy weather. 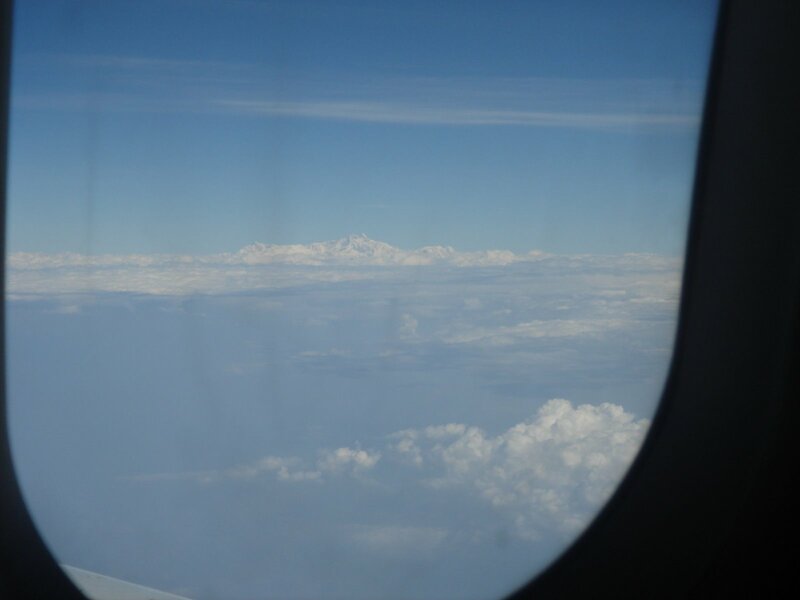 the clouds were even lower than before, and the prospect of catching a plane the next morning was not appealing. but no choice there, so driving through the Paro streets for the last time, all we could do was to take everything in and commit to memory. the people were calm, good natured and friendly, our guide also had a great sense of humour, all the quaint places and unique culture make this a must visit, and not just once. there’s more to see further east, but needs a longer trip. since the airport is only in Paro, and all the travel in the country is by road, the further away you go, you need as much time to get back. After all the shopping, sightseeing and wandering around the streets of Thimphu, we felt a bit sad that we had to leave, but little did we know how amazing the next set of places was! 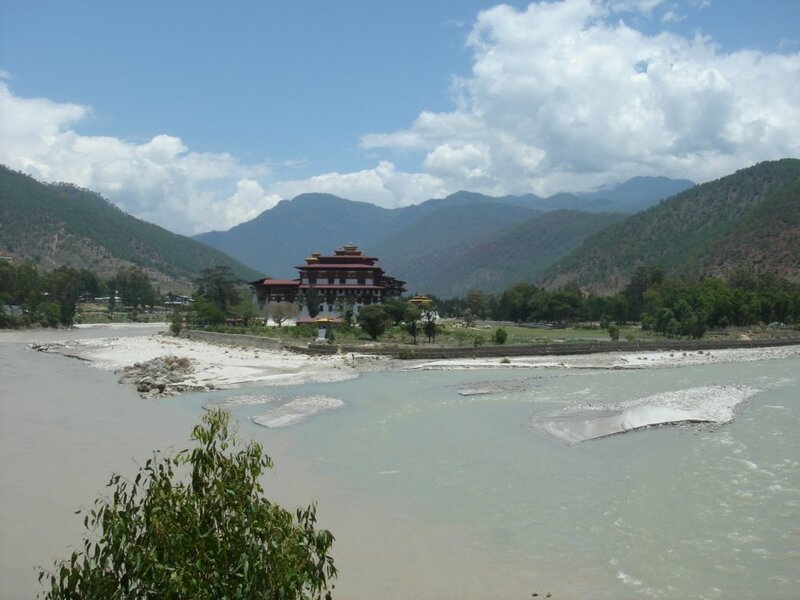 Friend was back to being sick (I don’t want to move, I can’t get out of the car, Go see everything without me, Sorry face etc) so when we reached Punakha, it was upto me again. its a small town, on the banks of a river. 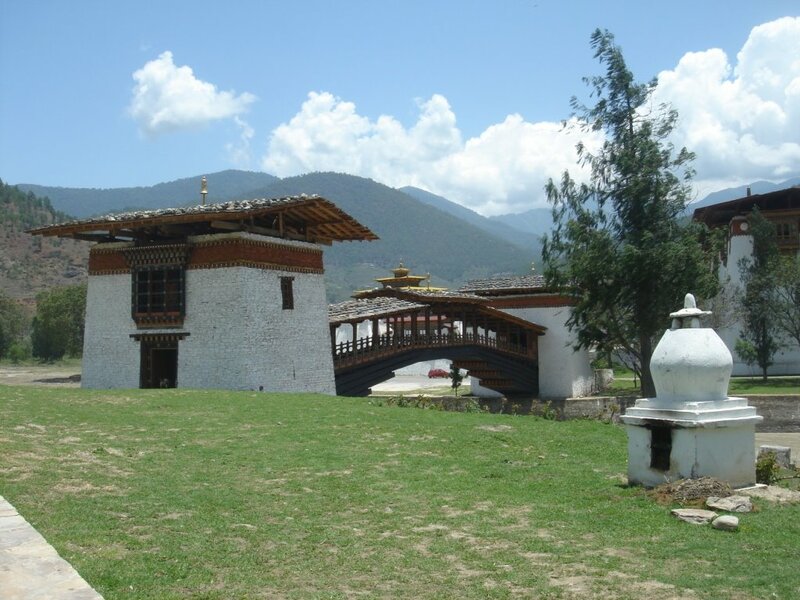 known chiefly for the Punakha Dzong, one of the oldest in Bhutan, built in the 17th century & without a doubt the prettiest one i saw. 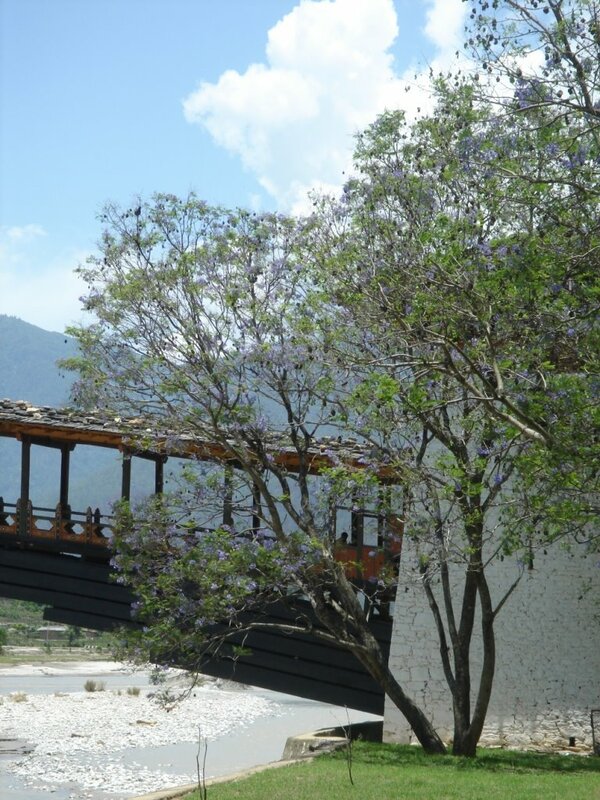 right from the approach bridge, to the giant white stupa and bodhi tree in the courtyard, to the beautiful jacaranda trees in full bloom by the river side, it was breathtaking. i could have sat there for a lot longer! from here, we went onto Wangdi, or Wangdue Phodrang, an area in the mountains, though our resort (Kichu Wangdi Resort, sister of the one in Paro) was about 7 Kms away from the village and quite literally in the middle of nowhere. situated at the banks of a gushing river, too dangerous for white water rafting even, with densely forested mountains on both sides. 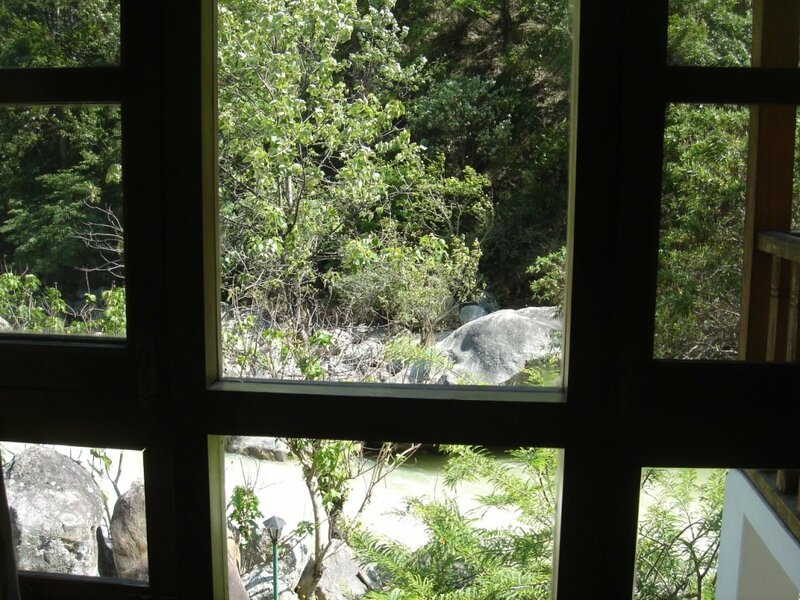 felt the closest to nature here, the rooms overlook the river, and you hear it all night. quote unquote friend “it sounds like a noisy AC” – trust an urban dweller to say that! 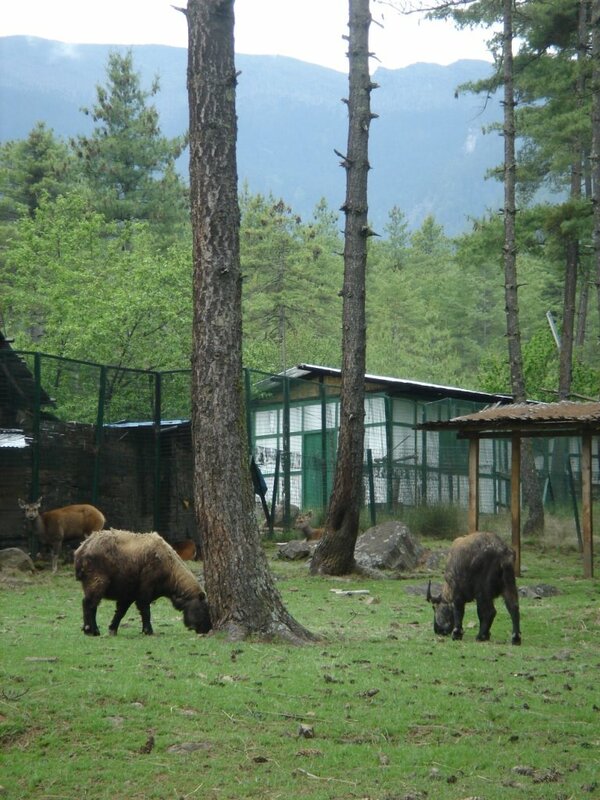 this place is highly recommended, but be warned, it is not for those who want ‘action’, there is very little cell coverage, only in certain spots, no internet, no TV (and no meat, surprisingly the one all veg resort we found – cos there is a rinpoche in the family of owners). if you expect all that, this is not the place to be! but if you want to visit a memorable, beautiful, exotic place, put this in your itinerary. 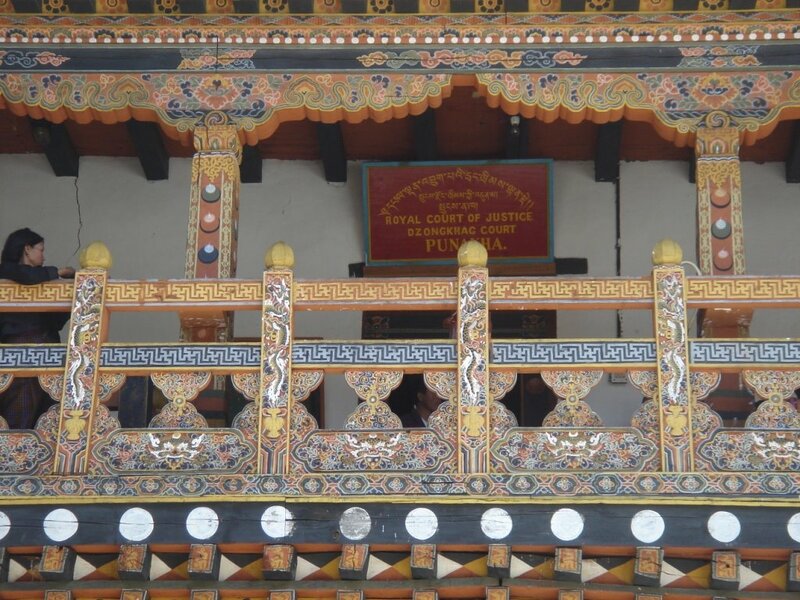 it also seems to be frequented by the glitterati of Bhutan. during our stay, a group of 10 americans, guests of the king, stopped for lunch, and the health minister stopped for tea. 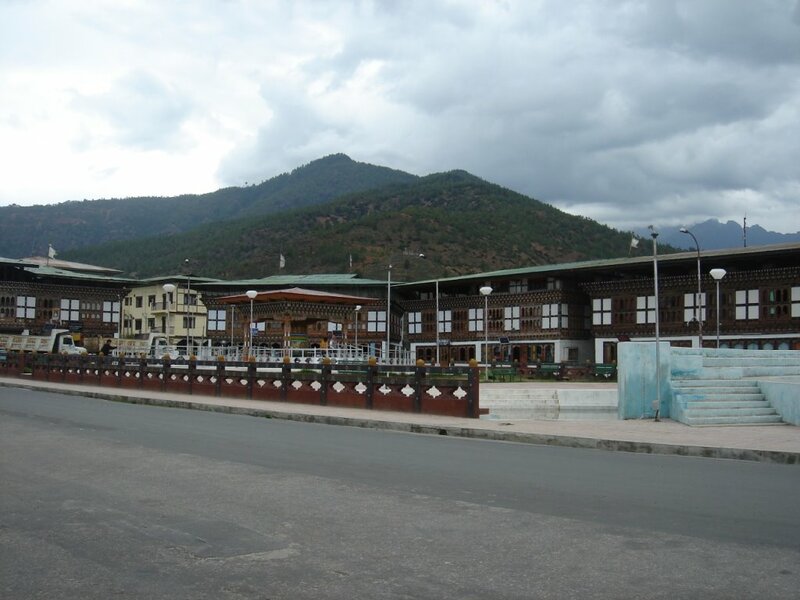 Thimphu is one of the prettiest capitals i have seen! 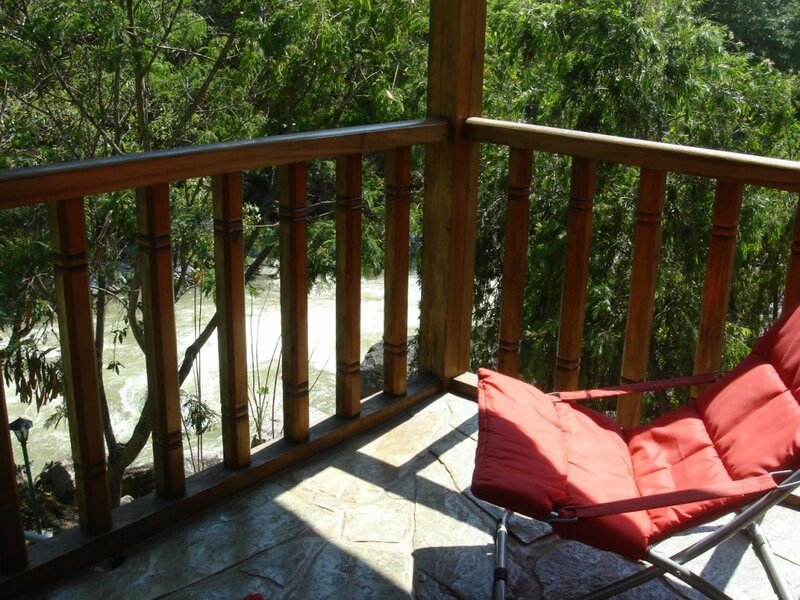 it also helped that we had an amazing view from our hotel – Hotel River View. we could see the whole city from one side of the river. with mountains, low hanging clouds and a very pretty promenade, it had a charm to it and we could have stayed on for a few more days. 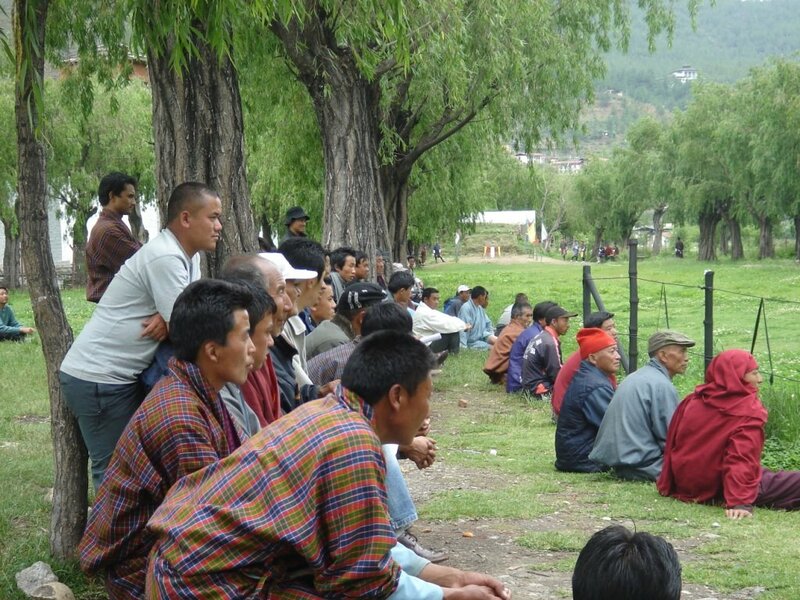 its the more modern face of Bhutan, where everyone does not wear the traditional clothes, also has expat population. but the stupas, the palace and the government building don’t let you forget that it is Bhutan after all. our 2 days in Thimphu were spent exploring everything including the monasteries, the national animal, Takin, said to have the head of a goat on the bones of a cow! there are very few left of this unique animal. apart from all the exploration, can city girls do without the bars and cafes? no, we can’t! 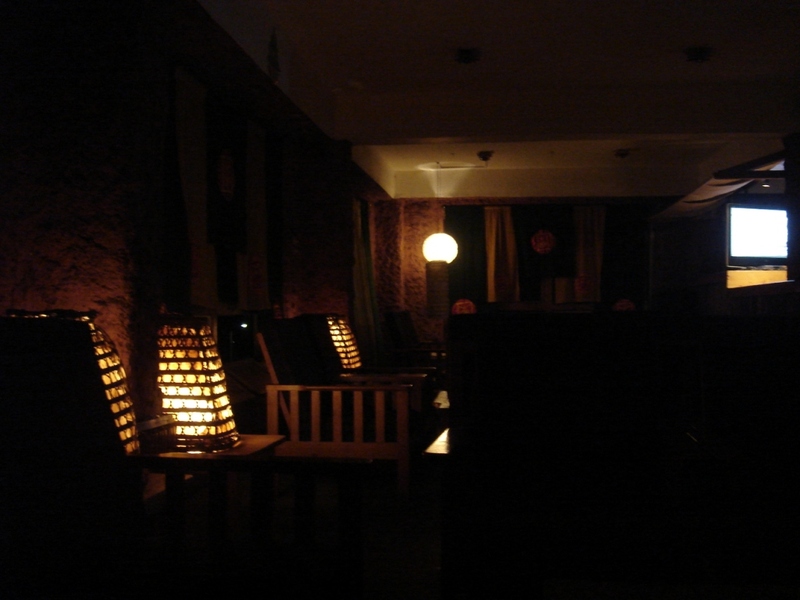 Om Cafe and Om Bar (opposite each other) provided the perfect place to relax in the evening, they even had free wifi! our first internet access in several days. 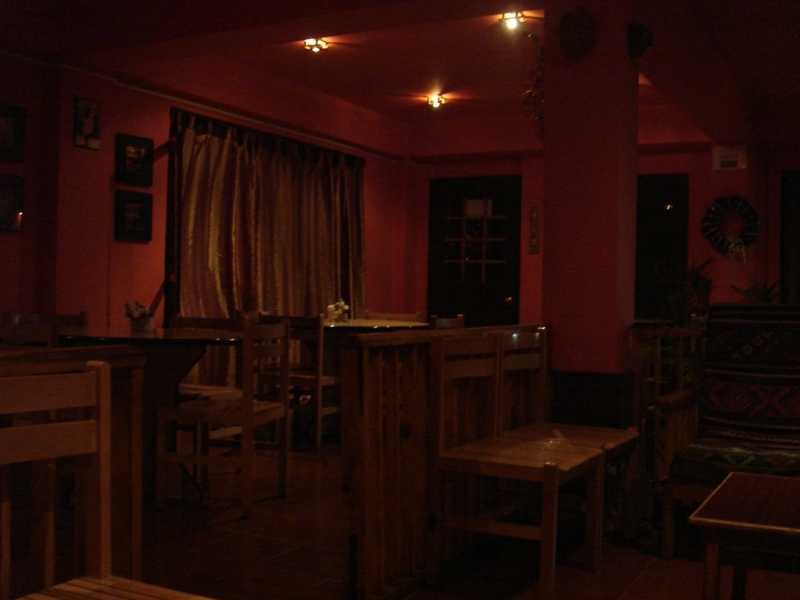 with equally great food & ambience, Art cafe also turned out to be a great place for lunch. 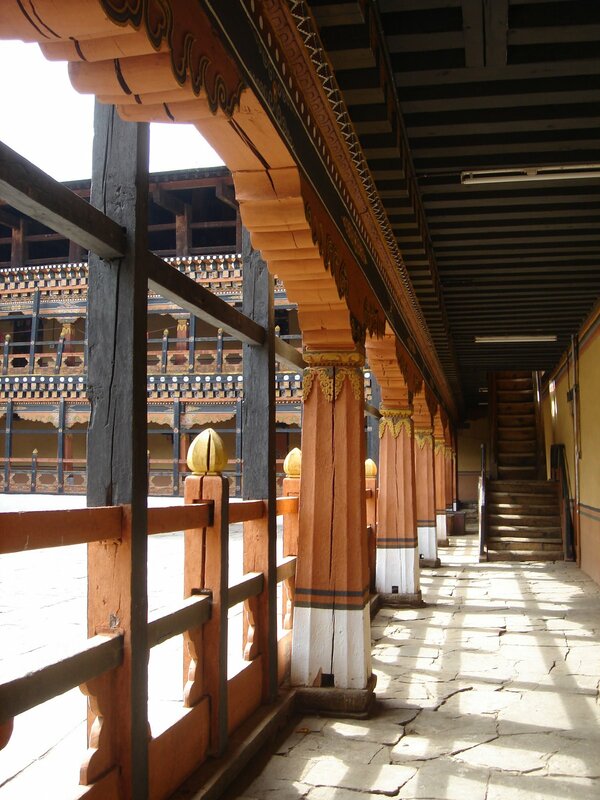 Thimphu also had the best place to shop for curios and artefacts. while there are many shops in the main market, we found that the shop attached to the National School for Art and Painting had lovely work, and we felt more confident of the quality here. this is the place we pretty much spent all our money at, only realising later how much packing we would have to do! 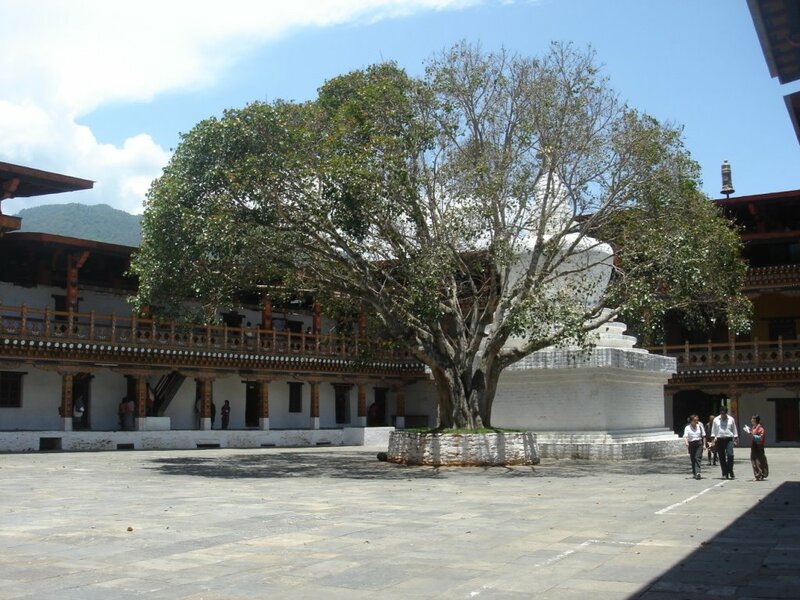 at this point, we were excited to see more of Bhutan, so Punakha and Wangdi, next on the list, belied all our expectations by literally turning out to be ‘saving the best for last’. 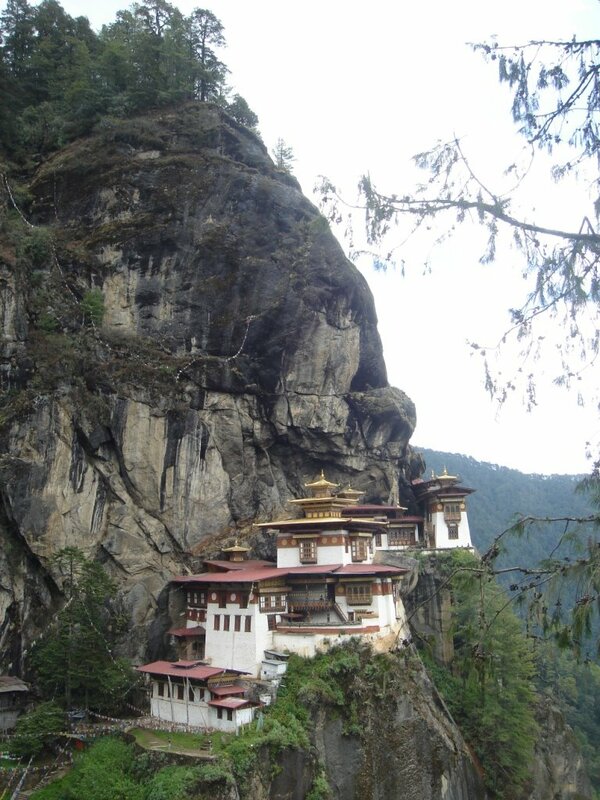 i was looking forward to the second day at Paro, cos it involved climbing to Taktshang Monastery, also called Tiger’s Nest, since it was apparently created when a holy man flew to the location on the back of a tiger! its impossibly perched on the edge of a mountain, and i was told that the climb would take around one and a half hours, this meant i would take 2! 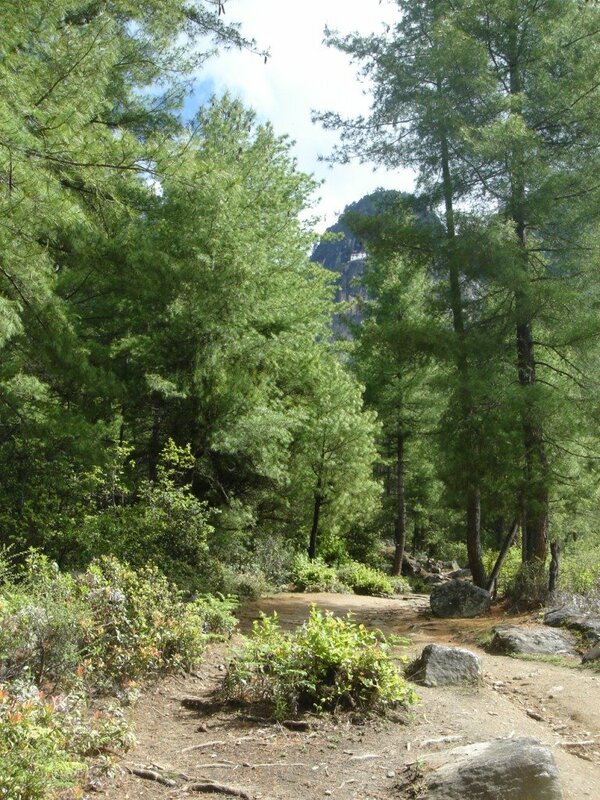 i was ready for the challenge tho, i had been wanting to climb up mountain paths, especially in that glorious weather. my friend couldn’t handle it too well tho, since the height also meant lesser oxygen than one is used to at sea level, so i pretty much did this on my own, just followed the path, it was quite easy. you can see it in this photo taken at the start of the climb, the white structure in the distance. since i was not used to climbing, and the air a bit more rarified, i had to keep stopping each time there was a particularly steep section. there were other tourists doing the climb, one group of malaysians even had an old couple who used a walking stick and had guides holding an arm, but they were unfazed and continued to climb. once i reached the top and could see the monastery straight across, i hadn’t bargained for the steps! stone steps cut into the hillside run round the cliff to the monastery and after that climb, make your legs feel like they are in a torture chamber. in most parts the steps don’t have any safety railing, and there’s just enough room for one person to pass through. i was a bit jittery in this section, wondering if i would fall off the cliff without anyone knowing! until a group of Indian army jawans came up behind me, and they made it look so easy, that i made the rest of the steps with renewed effort. 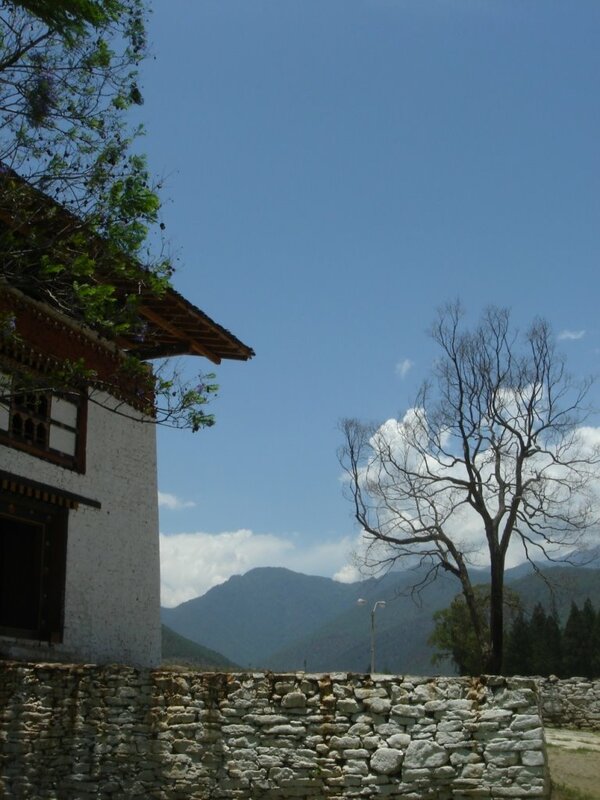 on reaching the monastery, i was asked for a permit by the armed guard. i didn’t have any! the guide was still with my friend, i had gone on ahead and i didn’t even know about this. he looked flummoxed at my answer and said, ‘pati kidhar hai, baccha kidhar hai’ and i had to try hard to not laugh – what kind of a qs is that! after some persuasion, and emotional lines like, ‘i walked for so long’, he let me in so i got to see . the monastery was lovely, explored some parts of it, wondered how the monks who live here go up and down constantly, had a talk with the jawans who were stationed in Bhutan for training for a few months… and then headed down. overall this was the best day of the trip! we set off for Thimphu the next day, it’s actually only about an hour and a half from Paro, but we were taking a different route. 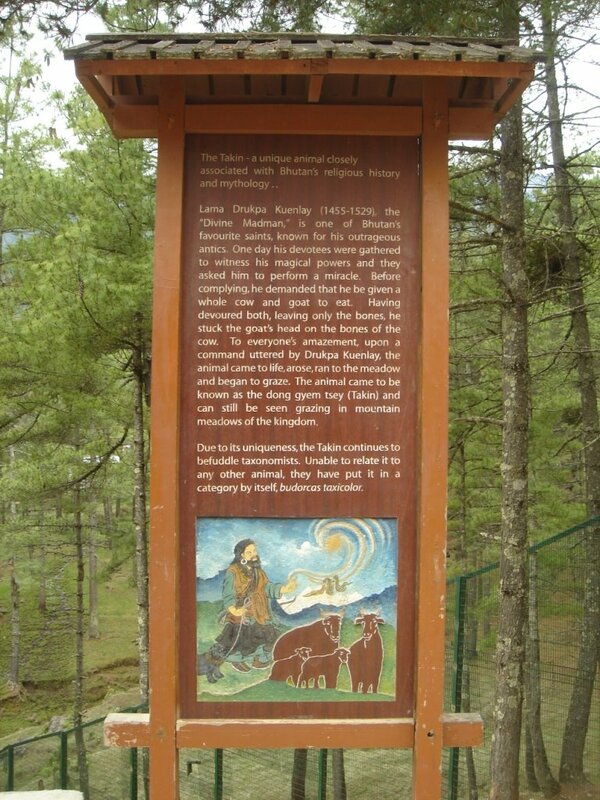 its a detour to Haa Valley, a not so known part towards the south that we got to via the Chele La, the highest motorable road in Bhutan. had loved the trip to KhardungLa in Ladakh, so wanted to see this. well, it wasn’t quite as scenic as that, but pretty all the same. there’s nothing to do at the top except stop for the view, which is lovely. 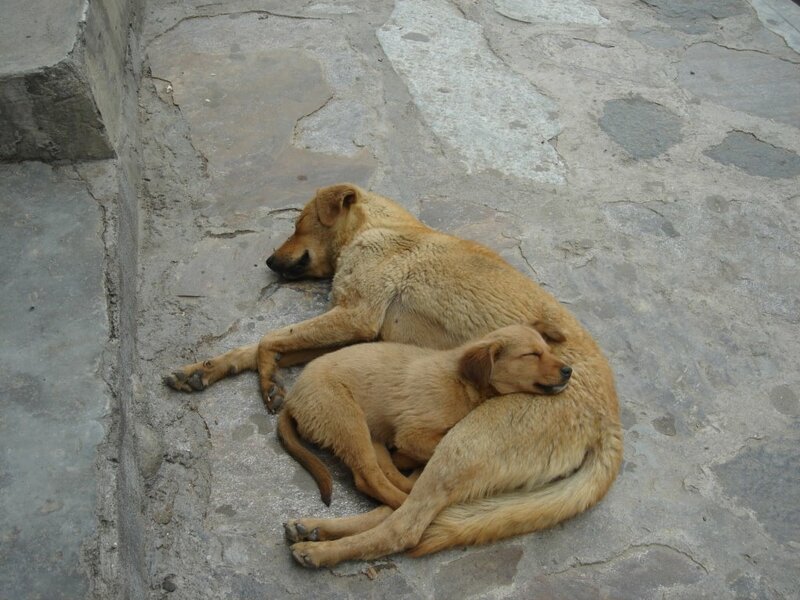 There’s no rest stop or anything. prayer flags adorn the hills and on clear days (usually in winter) the Himalayas are in full view. my friend was sick through the trip, the winding roads didn’t agree with her. at one point we were about 100 kms to the Indian border at Phuentosholing, so i suggested she make a run for it! but she said knowing her luck she would land in naxal territory and get caught, strangely clairvoyant in a way considering what’s happened in Bengal lately. along the route we also saw all the destruction caused by the Aila cyclone, the rivers had washed away some bridges and parts of the road. Haa itself is a very small town, some parts of which we could not see as the roads were blocked by rocks, that happened during the cyclone too. 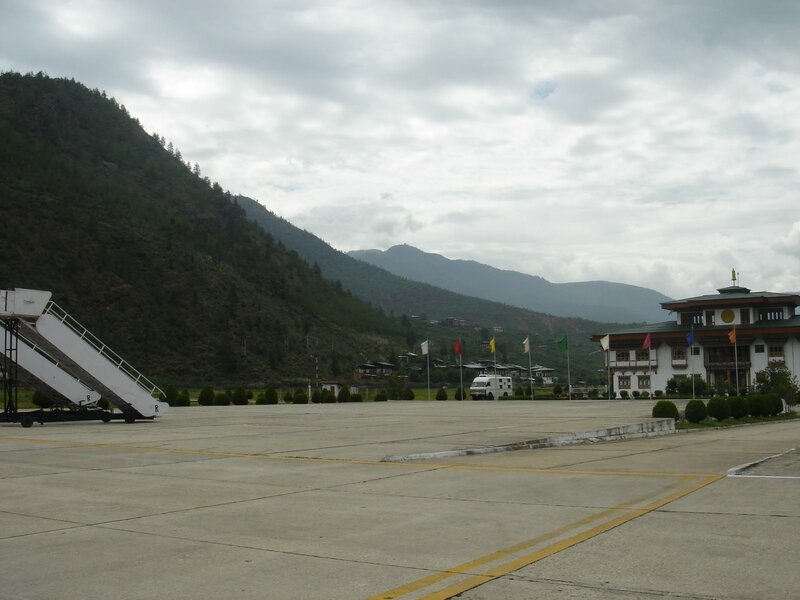 this trip took about 5 hours to Thimphu, and i loved every minute of it. 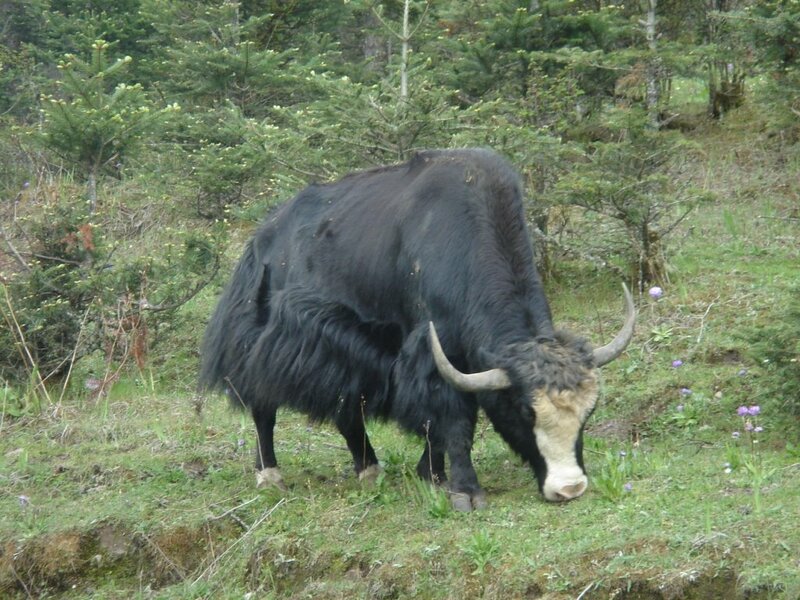 also saw a yak for the first time! 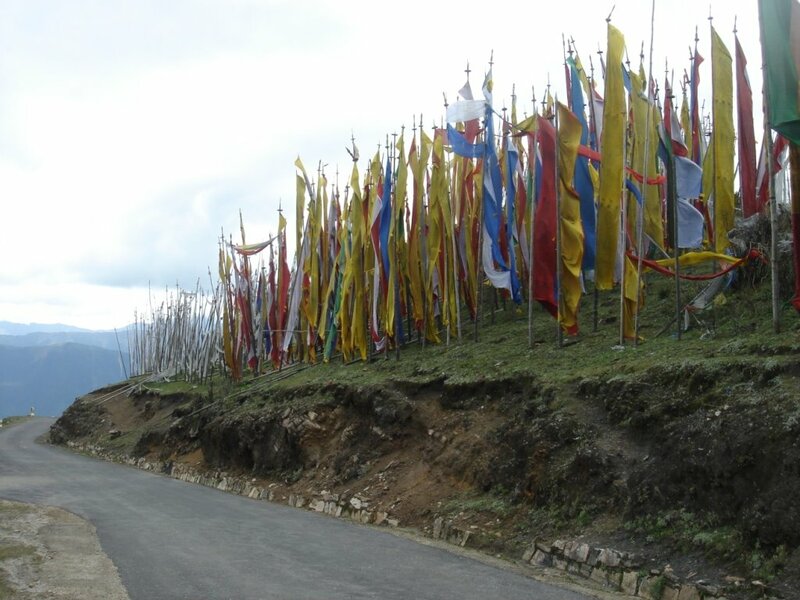 if you don’t want to spend so much time on the road, there’s the shorter Paro Thimphu route.